Guest Post - We have both spent a lot of time traveling around Spain over the years, and really love the place. So when Dom approached us asking to share this guest post ? we had to post it for you guys. Translated into English as ?Coast of the Sun?, the Costa del Sol is arguably Spain?s most popular holiday attraction, mainly thanks to it being the best place for sampling the four Ss: sun, sand, sea and sangria! Located in southern Spain, along the Mediterranean coast, the Costa del Sol attracts millions of visitors each year and it?s obvious why! The well-known city of Málaga has plenty of things to do and see, including the birthplace of Pablo Picasso and a number of museums and art galleries. The Costa del Sol also provides plenty of opportunities water sports including water skiing, windsurfing and snorkeling. But if you do decide to take part in a few adventure activities, don?t forget to get covered with a good travel insurance policy! 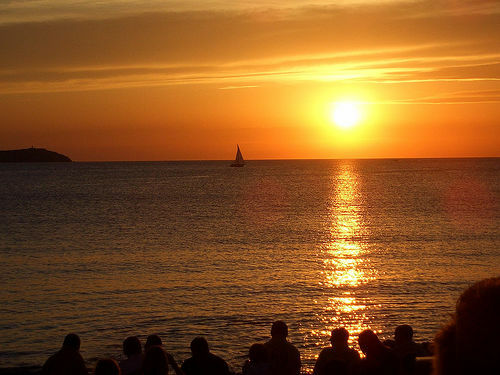 The Balearic island of Ibiza is well-known as the Mediterranean?s party capital, drawing in millions of clubbers and party-goers every year. Ibiza is home to a large number of world-famous clubs, including Space and Privilege Ibiza, which is considered the world?s largest nightclub. To recover from all the partying, or simply to start off your evening, you can always relax by the sea at Café del Mar and watch the sunset to the sound of some soothing chill-out music. Alternatively, if the wild nightlife isn?t for you, Ibiza has plenty of other sights and smells. Ibiza has been named as a World Heritage Site by UNESCO for Ibiza Town?s architecture and the island?s rich sea life. The island also has a number of family-friendly resorts. Surely one of Spain?s most notorious (and most dangerous) pastimes is the running of the bulls in the city of Pamplona. As part of the running, a small group of bulls (usually a dozen) are released on a course of streets which have been sectioned off from other areas. The goal is to run in front of the bulls without being overtaken. Perhaps the most famous running of the bulls takes place during the seven-day festival of Sanfermines in Pamplona. The festival is held in honor of Saint Fermin, who is the co-patron saint of Navarre, the region of Spain that Pamplona is the capital city of. Since 1910, 15 people have been killed as a result of taking part in the run and between 200 and 300 people are injured each year. So, if you go there, make sure you watch out, but have heaps of fun ? if you have any more questions about visiting Spain, just ask us! Stockholm Weather ? When Is The Best Time To Visit Stockholm?